There aren’t too many folks who don’t enjoy a tasty piece of candy every now and then. For collectors, containers that once held candy last a lot longer than mere sweets and they can be just as fun. Older candy containers doubled as toys after the candy was gone providing hours of play for both boys and girls. The first candy containers were shaped like Independence Hall and the Liberty Bell in celebration of the Centennial Exposition in 1876 in Philadelphia, according to collector Betty McDuff. By the early 1900s, candy containers were being produced in mass. A number of well known Pennsylvania glass companies produced these clever collectibles including Westmoreland Glass Company, Jeannette Glass Company, Victory Glass, and L. E. Smith along with a number of others. Some Victory Glass pieces are marked with a raised V over G logo in the glass. Sold in dime stores, at souvenir stands, and even through mail order catalogs like Sears & Roebuck, these glass toys were popular and plentiful back in their day. Collectors find that some examples are harder to come by than others. Animal shapes are some of the most common and least expensive types of glass candy containers found. These are great for beginning collectors, and even children who might have an interest in starting a collection. Figural glass bottles shaped like dogs topped off with metal caps or cardboard stoppers rate as easy to find, as do small lanterns with plastic or metal trim and candlestick telephones, among other containers that are seen frequently at flea markets and antique shows. These rarely sell for more than $10 apiece in online auctions, but may be priced slightly higher in other venues. Other containers made to look like figurines after the candy was emptied took the shape of rabbits, roosters, and a variety of other animals in clear glass. They generally had cardboard bottoms that have long been removed, but occasionally you’ll run across one still full of colorful little ball-shaped sweets. One still full of candy will be worth a little more than an empty one, but these are still too plentiful to bring much in the secondary collecting marketplace – usually less than $20 each. When you start shopping around for these interesting little collectibles, you’ll quickly notice there are those that show up over and over again. After you get a feel for what’s commonplace, then you’ll more easily recognize more desirable pieces when you run across them at bargain prices. 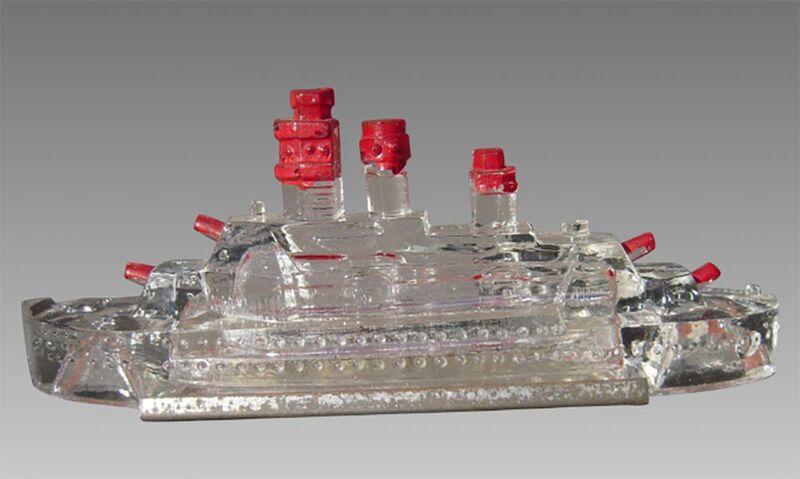 Finding older glass candy containers from the early 1900s in more interesting shapes, like a cash register or a submarine with the original flag and metal periscope, will prove to be much more lucrative should you decide to sell them at some point. Those can bring $300 to $500 or more if they’re in excellent condition. Containers made of painted glass, especially those in holiday shapes, can also be quite hard to find and pricey. Take a Halloween witch with an orange pumpkin head or a full-bodied yellow Easter chick as examples. These can both sell in the $400 to $600 range if the paint is in excellent shape, and even if the paint shows some wear they’ll still bring in a couple of hundred to the right collector. Other rarer antique candy containers can be found shaped like doll furniture and children’s china pieces. Those from the Flossie Fisher Funnies collection made during the 1930s usually sell for at least several hundred apiece. If in mint condition, they can bring even more. Some extremely rare examples like a 1920s refrigerator or Statue of Liberty can sometimes sell in excess of $5,000 if they’re in excellent condition. Many of these toys can be dated by the style, such as the 1920s refrigerator mentioned above or a 1920s gas pump. Others can be dated by how they are sealed if that apparatus is still in place. Pre-Depression candy containers, those made from the early 1900s through 1929, were usually sealed with metal components. Production stopped during the Great Depression but when it resumed in the 1940s, metal was scarce due to the war effort so cardboard was used to seal them along with cork and wood. Plastic eventually replaced glass as the material of choice for manufacturing these toys as a more economical alternative. It’s safe to assume that all genuine (as in non-reproduction) glass containers were made prior to the 1950s. Many reproduction candy containers have been made of colored glass, namely cobalt blue and pink simulating Depression glass. These many times described as Depression glass by sellers who haven’t done their homework even though candy containers were not produced during the Depression years. Some are made of “slag” glass, which is swirled transparent and opaque glass made in many different colors. Others have a carnival, or iridescent, finish to them. If you find a colored glass candy container that doesn’t have the color painted on, it’s best to assume it’s new without doing further research. There are very few exceptions. These new copies of old containers range in shape from pistols with metal caps to locomotives and Boston Terrier heads, along with other varied designs. Some people buy them just as novelties or because they like the colors but rarely do they pay more than a few dollars each for them unless they are unfortunately duped by an inexperienced or dishonest seller.